Torso pitch: -34° to +45° while standing. -34° to +55° while crouching. The Uziel is an Inner Sphere second line Medium Mech, equipped mostly with medium- to long-range, direct-fire weaponry, making it a great sniper Mech that can double as a brawler in a pinch. The Uziel has fairly standard Armor and maneuverability for a Medium Mech, but stands out by coupling this with above-average firepower and incredible utility. The Uziel has a very cramped and restrictive cockpit. It has a very limited vertical field of view, which can quickly turn it into a death trap on more vertical maps like TSA ThunderRift. Pilots should also be aware of the Uziel's width, as it's easy for one of the arms to poke out from behind cover without the pilot realizing it. The Uziel is unique in that it currently sports two new cosmetic features: destroyable components and triple Jump Jets. 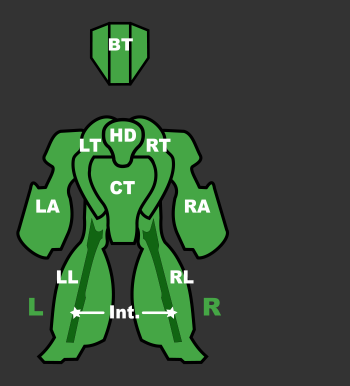 When the Uziel's side armor is destroyed, the armor plates will visibly detach, and the JJ animation for the Uziel has a third booster instead of the standard two like all the other Mechs, though it does not bring any real combat benefit. The Uziel Prime mounts as its main weapons a pair of PPCs, giving it impressive firepower at medium to long range, as well as allowing it to disorient enemy units with the PPC's effects. Improved Jumpjets give the Prime variant the mobility to engage enemies from unexpected angles, being able to jumpsnipe, as well as make use of shorter cover through its controlled upwards thrust. A single SRM6 gives it extra firepower if it's forced to engage foes from close up, but it's better served by making use of its mobility to maintain skirmishing range. 2 MGs can be used to fend of BA in tandem with its SRMs and harass ASF and VTOL at long ranges. Used as a mobile harassment platform, the Uziel Prime can dash from or jump out of cover, fire its PPC's, and retreat, giving the enemy very little time or chance to line up a shot. Relying on it 4 DHS some pilots find it smart to split it's two PPC's to two separate groups, allowing to shoot from partial cover without wasting the obstructed weapon's shot. This however requires a fourth weapon group, or to, unwillingly, put the MG's together with the SRM6. Nicknamed the "iPoke", the A variant is an ultra long-range platform, capable of providing direct fire support from ranges beyond their target's radar. Mounting 2 LtGauss Rifles, it can reach targets from 1250m out, and in combination with its Jumpjets is capable of Jump Sniping from ranges that make it extremely difficult to be spotted. The weapon's high velocity also makes it a viable anti-air choice. 2 free tons provide a bit of extra ammo for sustained fire, and a pair of machineguns give it further long-range harassment options, as well as providing some protection against Battle Armor. Unfortunately, this variant's ultimate weakness is its low damage output, making it more suitable for softening up incoming targets and finishing off stragglers, depending on its teammates to do direct engagements. This makes it a bad choice when heavier firepower is required to engage in or defend against pushes, although it can be a viable choice for a team employing a long-range kiting strategy in games without respawn. The lack of backup weapons suited to short range fighting and decreased armor compared to the rest of the Uziel variants mean that close range engagements will spell its certain doom. The Uziel B is a swift, cheap and powerful brawler that brings some serious firepower for its pricetag. Mounting a SSRM6 and DSSRM4, it is capable of firing salvos of 14 missiles, or chain firing them for extended screenshake. A quad array of SPL increase its firepower to scary levels, helping to put its disoriented targets out of their misery. Unfortunately, this combination of weapons requires getting into ultra short range combat to fully tap into the variant's damage potential and being able to spare only one ton to store a spare reload of bulky streak ammo makes it reliant on its supply chain. The larger launcher is capable of nine salvos only, and as soon as it begins to reload the SSRM6 is three shots away from running completely dry. This shortcomings are somewhat alleviated by the mech's inherent speed and maneuverability inherent to it's class, allowing it to take on quite heavier opponents in isolated duels, and that - quite successfully. A MASC enhances its already respectable speed and helps the Uziel B to close into its preferred range while making the ammo runs more bearable, but even with 4 DHS pilots will have to be strategic about its use and are still bound to run into heat issues during longer fights. 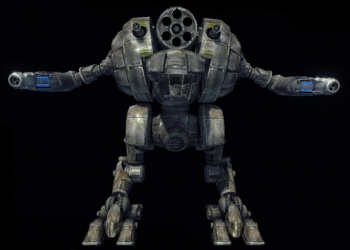 The Uziel C is a peculiar mech, bringing its full firepower to bear in close range fighting, but capable of engaging enemy forces at medium distances. One of the cheapest Uziel variants, an AC10 forms its main skirmishing tool, although the uncommon addition of a Thunderbolt 5 allows it to engage enemies from a bit further out if its user is willing to run active radar to enable its lock-on feature. A bit of care should be taken when aiming the missile at longer ranges, as its turning capabilities are limited, a drawback it makes up for by having no minimum range. As the distance to the screen-shaken enemy decreases, the Uziel C can bring to bear its array of 1 Medium X-Pulse and 3 Small X-Pulse Lasers. The former can be employed as the distance begins to turn from medium to close-up, but the latter need you the be within 300m of the enemy to be of use. The main drawback of X-Pulse Lasers, despite their high damage potential compared to other laser variations of the same size, is the extended time they need on the enemy for their damage to add-up, and the difficulty of keeping them trained on specific components in the heat of battle. All of this makes the Uziel C a variant more suited to begin engagements as mid-range support, closing the distance with its Improved Jumpjets after the dedicated brawlers have already engaged, or against opponents not best suited for close range combat. Care should be taken to make use of all of its weaponry in order to maximise its damage potential. Its 2 DHS barely provide sufficient cooling, as its jumpjets are not the only source of sudden bursts of heat. Being an energy boat, the D may depend only on an occasional coolant replenish, and that only in the hottest and most unforgiving environments. Being a C3 faring unit, it is worth noting that while an active C3 equipped radar does generate profit, it is at the same time a luring beacon for the enemy team to home on to. So either be in a group or use the C3 at your own risk. It is further noteworthy that the somewhat better ranged light PPCs duo is quite less to be relied on than the Medium Pulse Laser quartet. Not only does one MPL have more damage output in a single burst than one LPPC, but the damage dealt over time is almost the triple weapon for weapon. And having twice the lasers really makes obvious what the pillars of fire power on this unit are. The hardest thing yet is to sell this unit in the end. Yes it has staying power, yes it has extra mobility, yes it has extra equipment, but it is neither an brawler nor an skirmisher, for one it lacks the punch, for the other the range. It can serve a role of an command unit in an orchestrated campaign, with some extra sting. And occasional de-NARC service for friendly units at disposal. For the pilot who can rely on his teammates. A variant clearly meant for long range skirmishing and harassment. One of the cheaper variants, the Uziel E is armed with a pair of Extended Range Large Beam Lasers backed by a duo of AC5, allowing it to engage enemies from 800m out. Lacking the mobility enhancing equipment common to the chassis, its user must remain aware of their positioning, not shying away from tactical retreats in order to maintain their range advantage, as it's easily overpowered by brawling assets, despite its weaponry not losing effectiveness at closer ranges. In order to take full advantage of its firepower, users must be aware of the different leading required for its two weapon types as long range autocannon shots are much harder to land than pinpoint laser fire. Even though it lacks the mobility, splash and screenshake of the Prime, the range of the A, or the jumpsniping capabilities of either, it makes up with a damage dealing potential that's superior to both. All of its weapons are suitable for defending against Battle Armor or air assets, although chain-firing should be employed against the former due to a relatively slow firing rate. Its 2 DHS are enough for the mech to be impossible to overheat in normal temperature maps. As an agile LRM boat, capable of operating even without spotter support, for the Uziel F's main weakness compete both its lack of enhanced optics and its somewhat mediocre staying power. The main armament being a trio of LRM10 launchers, it's capable of a significant long range punch at a theoretically high re-fire rate, with the option of a long and sustainable chain fire when it's deemed strategically advantageous. Its mobility, with the land speed and agility already inherent to any of the Uziels, is furthered by the Improved Jumpjets. This exactly, along with its backup duo of MBL for point blank defense, make it a competing rival to the other units of comparable role and price tag. The smaller nature of the launchers also means it will take more volleys before they need to reload, but for when they do the variant can only carry 2 spare tons of ammo, forcing it to carry on at only two thirds of its maximal firepower. A sole DHS will force pilots to either take some time to cool down or chain fire their missiles during painfully prolonged engagements. Still the units main selling points remain it's affordable price for the early game and its enhanced mobility. Simple layout isn't always the easiest to use. It is recommended to group the two lasers to a separate fire buttons each. The mighty LXPL while lacking an pronounced punch, still deals it's steady stream of damage from point blank out to 750m in the field. And the pair on this variant can wreak havoc on any unit not swift enough to flee for cover in time. The SRM4 is handy for a final blow or any stray BA unlucky enough to wade in the vicinity of this unit. Lacking any exotic equipment save the two LXPLs this unit gambles it all on medium range pulse power and heat dissipating capacity strong enough, to keep it coming. The 8 DHS are quite promising in this regard. The key selling point of this unit is the twin X-Pulse power in the 750m range. With no compromises. Initially the Uziel was an unpopular 'Mech because of it's light punch (especially at short range) combined with a large hit-box which made it feel more lightly armored than other medium BattleMechs. To counter this a new DSSRM variant was introduced to provide a powerful short range version of the 'Mech and in version 0.5.4 the Uziel was resized to be in line with the other medium 'Mechs. In 0.6.0 the Uziel was further improved and had most outdated tech replaced with more expensive and better equipment (e.g. mounting DHS instead of HS), as well as having 2 variants replaced with new and significantly better ones. Still, the stigma of being useless and weak clings to it even in the days of 0.6.0, even tough the new variants added and modified in that patch could hold their own against any target that is in their price category and some mechs that are above. In the 0.8.0 community edition of the game, the Uziel is more viable than ever, with armor being redistributed to toughen up its huge central torso and new variants, it's the Inner Sphere's mobile skirmisher medium. The Uziel is a fast, jump capable Medium 'Mech armed with a variety of weapons: an LBX-2 for longer ranged shots, an ER Medium Laser and Large Pulse Laser for medium-range combat, and two ER Small Lasers and a single SRM6 for some short-range kick. However, the most well-known variant of the Uziel has a PPC on each arm, two Machine Guns and a single SRM6 in the center. This type of Uziel was an iconic 'Mech in later Mechwarrior and MechAssault games, and made its first appearance in Mechwarrior 4: Vengeance.